Naturalskinshop.com has become the go-to for both professionals and savvy consumers when it comes to potent, results driven, clinical skin care. Over the years they have created several excellent at-home microdermabrasion products with stellar results and a cult following. 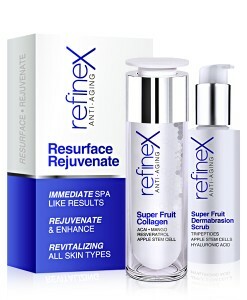 Their newest microderm creation, Refinex Resurface and Rejuvenate: Home Spa Set, combines the power of super antioxidant fruits, clinical grade microdermabrasion crystals, and potent chemical exfoliators to produce smooth, glowing skin. They’ve paired this with a powerful anti-aging, collagen stimulating serum for ultimate results in age correction. Clinical grade microdermabrasion crystals are important to achieve a thorough sloughing of dead skin cells. This allows the treatment products that follow to penetrate deep and absorb quickly and efficiently. Natural superfruit enzymes and alpha hydroxy acids provide a more well rounded exfoliation experience to dramatically increase cell turnover, stimulate healthy cell renewal, and speed up collagen and elastin production. Let’s also not forget about lessing lines and wrinkles, removing and lightening hyperpigmentation and discoloration, and keeping pores clear for blemish free skin. The Super Fruit Collagen Serum penetrates deeply to hydrate the skin, instantly plump, and maintain a healthy water content in the skin. Apple Stem Cells protect the healthy new skin and fight free radical damage caused by everyday pollutants in our environment. This serum provides instant, long lasting hydration, skin nourishment, and antioxidant protection against environmental aggressors. Hyaluronic acid plumps and hydrates, while peptides and proteins provide tightening, line reducing power, and moisture retention. Combining these two powerful products together gives guaranteed spa-like professional results, similar to having a professional facial. Continued use shows a dramatic increase in firmness, smoothness, a more even tone, and fewer clogged pores and blemishes for all skin types. 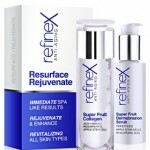 Both men and women can benefit from the clinical results achieved from the Refinex Resurface and Rejuvenate: Home Spa Set from Naturalskinshop.com. « How Important is Vitamin D For the Skin? Plenty, according to the new anti-aging formulation from Naturalskinshop.com.